After Old Polish, Old Hungarian and Old Italian Carrier Pigeons today are propagated as new exhibition breeds, there should actually be an Old German Carrier Pigeon, too. Models for the standard already exist. So in the German Journal ‘Geflügel-Börse’ 4/1971 (Fig. 1 left): Strong body with heavy wattles above and below the beak like the mentioned Old … Carriers. Beware of satire, some people may not think wrongly, because it is the old type of today's German Barb. The Barb formed with the Dragoon and the Carrier, the 'triumvirate' of wattle pigeons, which should cover all tastes, the Barbs as a short-beak, the Dragoon as a middle-beak and the Carrier as a long-beak (Fig. 2 right). He had heavier wattles, a shorter beak and a rounder head than today. Fig. 1: Barb in ‚Geflügel-Börse‘ No. 4/1971 and Carrier in No. 1/1975. For the standard change spoke at that time that many considered the original Barbs on the shows with interest, but that hardly anyone wanted to breed them. There were also animal welfare reasons. Fig. 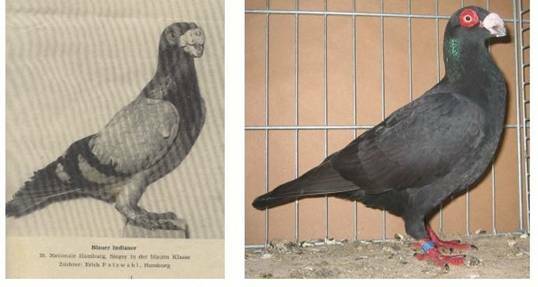 2: Barb blue, Champion National Hamburg 1953 (Taubenwelt 1954) and modern Barb from 2006 (Source: Sell, Taubenrassen. Entstehung, Herkunft, Verwandtschaften. Faszination Tauben durch die Jahrhunderte, Achim 2009). Nevertheless, today some breeders seem to miss the old types, who still lead a niche existence in other countries. Fig. 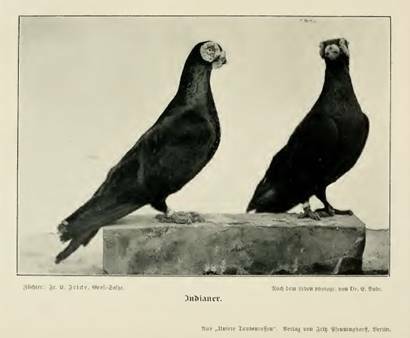 3: Barb black und head study of an old English Carriers in Lavalle and Lietze, Die Taubenrassen (Pigeon Breeds), Berlin 1905. If one speaks of Old Polish and Old Italian carrier pigeons, then there is the claim that such pigeons with extreme wattles existed in the regions as messenger pigeons in old days. That was not yet shown and the literature does not show that either. An overview of the pigeon breeds e.g. in Galicia was given by Prof. Jos. v. Rozwadowski = Krakow in the Columbia 1880. He mentioned there the 'Polish Pigeon', nothing of another specific polish carrier pigeon. 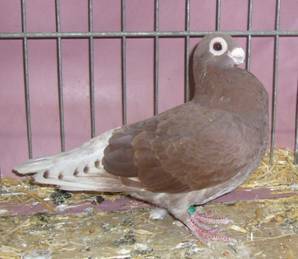 The Polish Pigeon is close to the Turkish and was called in France 'Pigeon polonais' since the breed according to Rozwadowski came from Poland, who was in permanent contact with Turkey in the Middle Ages. 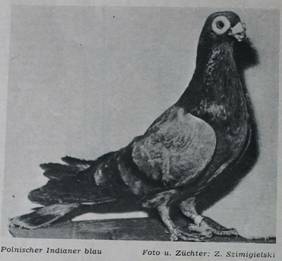 In Germany the breed was called Polish Pigeon or Indianer = Babs (Korthsche Tauben-Zeitung No. 30/1856). From an extremely strong wattling is no speech. Fig. 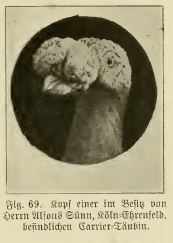 4: Polish Barb (Polish Wattle Pigeon) in a contribution of Joachim Schütte in ‚Geflügel-Börse No. 9/1967 and Ostrowietzer Warzentaube. 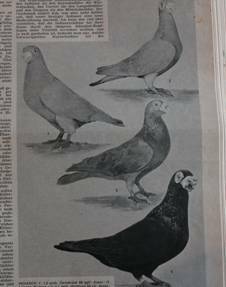 This also applies to the today Polish Wattle Pigeon and the Ostrowietzer Wattle Pigeon (Fig. 4), two Polish breeds in the succession of the "Polish Barbs" in the German Book of Standard. The new 'old' breeds then also connect to former exhibition carriers (Fig. 5) and barbs and not to messengers. They thus run and are promoted under a false label. Fig. 5: Turkish Pigeon red and old type of exhibition Carrier at the Naturehistorical Museum Braunschweig besides a Berne Half Beak (Source: Sell, Taubenrassen. Entstehung, Herkunft, Verwandtschaften. Faszination Tauben durch die Jahrhunderte, Achim 2009). 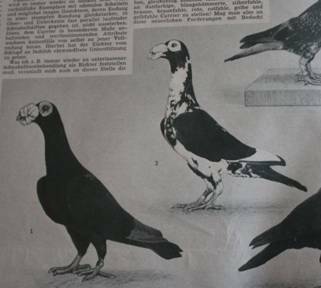 Even the historically interesting preparation of the now extinct Turkish pigeon (Fig. 5 at the left), which should have served as a historic messenger pigeon especially in the Turkish Empire before the emergence of the Belgian Racing Homer, has no extreme wattles. Anonymous, Taubenzucht, Tauben-Zeitung und Organ der gesammten Haus=und Federviehzucht, No. 30, Berlin, den 25. October 1856, S. 233- 235. Lavalle, A., und M. Lietze (eds. ), Die Taubenrassen, Berlin 1905.